Christophe Langlois of Visible Banking interviewed Matthias Kroener during a conference in Paris. The event was focusing on Social Media and its impact on the financial industry. Matthias Kroener, CEO of Fidor AG, talked about their Social Media Marketing Strategy realized in teamwork with Ahead of Time. 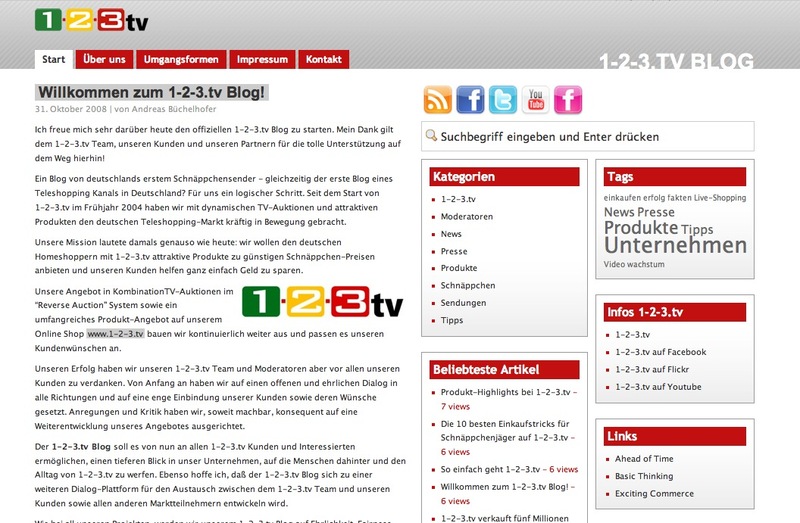 The German Teleshopping TV Channel 1-2-3.tv launched a corporate blog today. The Blog is part of an overall Social Media Marketing strategy integrating several Social Media Platforms, like Facebook (with a 123TV Facebook Fan Page), Flickr, Youtube and Twitter. Dopplr has released a new function. You can now publish a public profile. Here is mine. I am like a “Butterfly”, but, I am not as fast as Joi. I like the new Twitter Mashup called “Twistori”. Twistori is a social media experiment. It tracks all Twitter messages and searches for emotional keywords like “I love”, “I believe”, “I hate”, “I think” etc. and shows the messages on the site. The simple layout and the nice animations are well made. The IOC annouced the first “Blogging Guidelines” for the olympic games in Beijing. “The IOC considers blogging…as a legitimate form of personal expression and not a form of journalism,” the IOC said. The International Olympic Committee on Friday gave the green light to allow blogging at the Olympics for the first time, issuing guidelines for this August’s Beijing Games. Athletes have long demanded they be allowed to write their blogs–online journals of personal opinion or reflection–during the Games but the IOC was concerned these could potentially infringe on copyright agreements and private information. 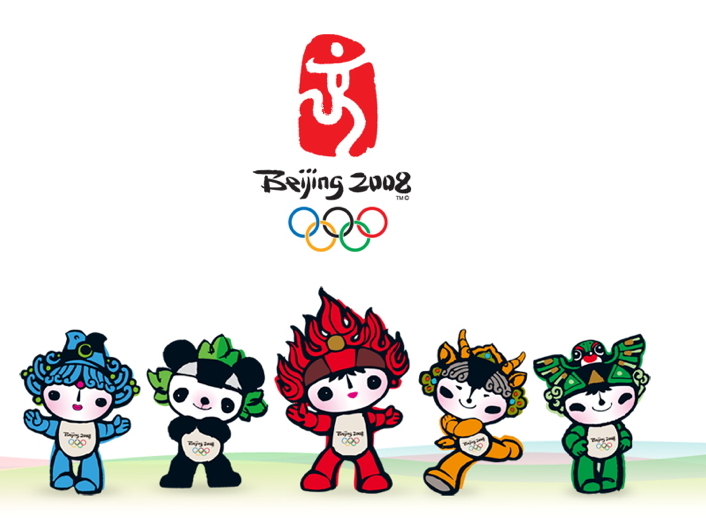 In a series of guidelines, the IOC said blogging would be allowed during the Beijing 2008 Olympics as long as individuals writing the journals keep within the IOC format. The eCommerce Guide wrote an article about Josefine’s work on our TrendBlog. This week in e-commerce news, marketing consultants say a new trend — online team-buying — is emerging, a free storefront solution debuts, and researchers say video game sales spiked Internet sales for the second quarter. Plus, a search-shopping site that can help increase sales for those with back-to-school gear. Josefine Koehn of CScout, a market research agency that specializes in spotting trends before they hit the mainstream, is citing online team-buying as a new development to watch. Team-buying, in which shoppers form collectives large enough to become eligible for group discounts, or in some cases demand them, first started in China where it’s called “tuangou,” according to Koehn, but now has caught on worldwide. As a result, sites, mostly in beta, are springing up to meet their needs. Do you already know the chinese Second Life? My collegue Daniel in Beijing did a great interview with Hui Xu, the founder of HiPiHi. HiPiHi is a 3D Virtual World similar to Second Life with focus of chinese users. Here is the interview – see also our China Blog. CScout recently China paid a visit to the office of HiPiHi in Beijing’s Haidian District, for an interview with Hui Xu. Hui, founder and CEO of HiPiHi, was the general manager of MyWeb China, and was nominated as one of the “Top Ten China Internet Heroes” in 1999. Hui was also the chairman and CEO of JingQi XiShu Co. Ltd, which became one of the most successful e-commerce sites in 2000. Together with Xinhua Liu, he co-founded HiPiHi in 2005. Can you briefly introduce HiPiHi? Why did you start HiPiHi? Is the Chinese market ready and who are your target audience? A new project is empowering the consumer to prefer or reject certain products which are environmental friendly or not. On the platform Climate Counts you can share your thoughts about companies and discus it with other eco-friendly people. So everybody can start doing something for our environment. Climate Counts is a collaborative effort to bring consumers and companies together in the fight against global climate change. We are a nonprofit organization funded by Stonyfield Farm, Inc., the world’s leading organic yogurt company and America’s first manufacturer to offset 100 percent of its CO2 emissions from its facility energy use; and launched in collaboration with Clean Air-Cool Planet, a leading non-profit organization dedicated to finding and promoting solutions to global warming. Everyone’s talking about global warming, but what can you personally do about it? Companies and the things you buy from them have a huge impact on climate change. When you make climate-conscious choices, you’re sending a message to companies that climate change matters to you. Some companies understand their impact on global warming and want to reduce it. But other companies aren’t even talking about it, and they should be. Without urgent action from business, stopping climate change may be next to impossible. I realized that my Blog is on the list the top 100 German Blogs – so somebody is really reading it. I am at place 34 right now…. That’s why I started to work on my blogging strategy…. -> Started two seperate Blog in two languages German and English. -> Furthermore I try to blog one post per day to get a sort of a rythm going. Om Malik wrote a great article about how the iPhone will change the wireless business. In a conference call earlier today, Larry Page explained the strategy behind the acquisition. â€œWe realized itâ€™s not very cost-effective to buy the internet in smaller portions.â€ During the past two decades, Google had acquired YouTube for $1.65, DoubleClick for $3.1 billion, AOL for $12.5 billion, and last year, Microsoft for the record sum of $120 billion. The Chinese government in the meantime congratulated Google Inc on their move. Regarding the potentials of expanded censorship, Sergey Brin told members of the press that Google would now drop all search results filtering and instead â€œaddress the root problem from a publisher perspectiveâ€ by directly blocking certain keywords the time they are entered in Google-owned tools such as Blogger, Gmail, Page Creator, Yahoo 360 and MSN Spaces. Amnesty International and Reporters Without Borders were not available for comment at this time due to temporary technical problems with their web-based email clients. I missed this movie. It was featured in June 2006 already. During my busy day I am attending a really cool Chat Swarm via Skype with over 75 people. 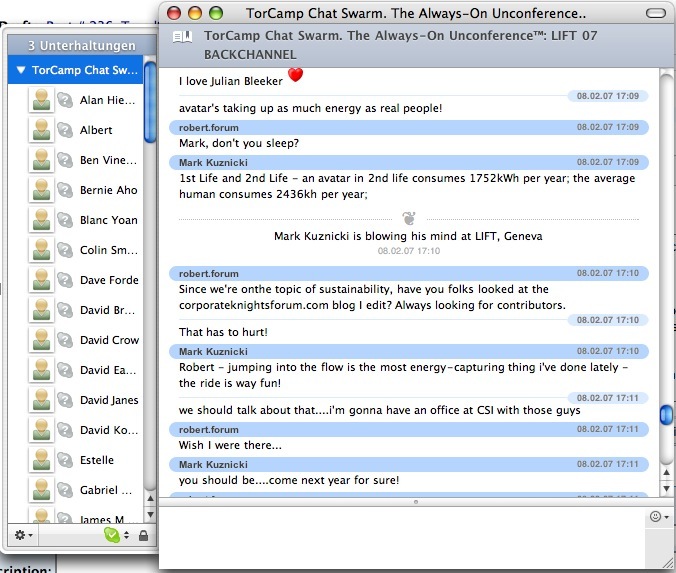 There are people chatting live from the Lift Conference in Geneva. So I can follow the most interesting quote directly and can interact with the others about the topic. Mark Kuznicki picked up the great relation between real and virtual energy consumption. In der aktuellen Ausgabe des Magazins “Creditreform” des Handelsblattes ist ein Artikel Ã¼ber das Thema “Weblogs als PR-Instrument” erschienen. Der Artikel beinhaltet ein Experten-Interview mit der CScout Trendberatung. Today I read at Marcel’s Blog that FON received 18 Million Euro in Venture Capital in their first investment round. Gratulations to Martin Varsavsky who founded the new wifi-venture FON. 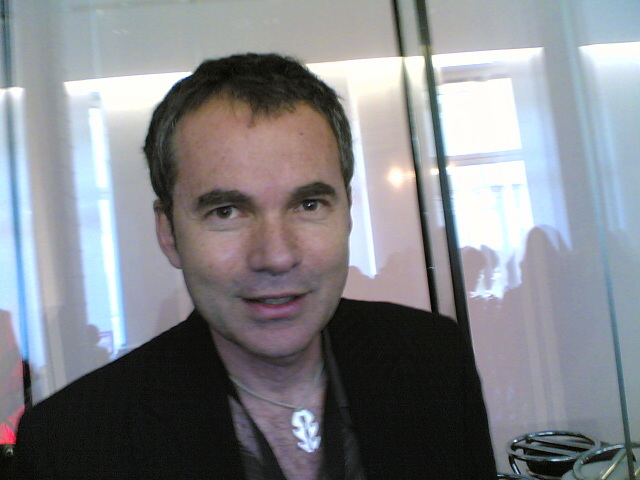 He was also speaking at the Digital Lifestyle Day 2006 in Munich. We really think this will be a hot business modell for the next years. Google, internet voice-call company Skype and leading venture capitalists have invested in a new user-run network of wi-fi hotspots, which they hope will become the biggest in the world by the end of the year. Google, Skype, Index Ventures and Sequoia Capital will announce on Monday $21.7m (â‚¬18m) in first-round funding for Madrid-based Fon to build on its growing global band of “foneros”. Foneros are users of the service and known as either “Bill”, “Linus” or “Alien”. Bill members â€“ after Bill Gates â€“ download secure software from Fon that turns their home wi-fi network into a hotspot anyone within its range can use to connect to the internet for a fee. Linus members â€“ after Linus Torvalds, creator of the free Linux software â€“ allow their hotspots and bandwidth to be shared for free and can use any other members’ without charge. Aliens pay to connect to the Fon network and do not share their own networks. Fon and Bills will share the revenues earned from Aliens and other Bills. The service went live in November and has registered 3,000 users in 53 countries in two months. Fon says it is growing faster than T-Mobile, the biggest network, with 24,000 hotspots established over four years, and expects to exceed this as word spreads. Internet service providers may object to their subscribers reselling the bandwidth being provided to them but Fon says some have already signed up as partners and can earn a share of Alien revenues from the venture. The company was founded by Martin Varsavsky, who previously formed Ya.com and Jazztel, respectively the second-largest internet and publicly traded telecoms companies in Spain. This deal shows how important local search is. – And how difficult it is to search accross countries and languages. Indian tech company now holds huge chunk in the search engine Seekport and plans to launch Arabic and Indian search engines. Grundlagen, Konzepte und Praxis im unternehmerischen Umfeld. Ich danke Tim fÃ¼r die Zusendung des Buches – es macht einen wirklich guten Eindruck. Bin schon gespannt darin zu schmÃ¶kern. Weblogs sind ein neues KommunikationsphÃ¤nomen, das durch die technologische Konvergenz von Medien, IT und Telekommunikation ein neues Gewicht erhÃ¤lt. Welche Chancen und Risiken ergeben sich aus dem Einsatz von Weblogs fÃ¼r die Unternehmens- und Markenkommunikation? Stellen die hÃ¤ufig als “grass-root journalism” bezeichneten Weblogs eine Gefahr fÃ¼r die traditionelle journalistische Arbeit und den Journalismus selbst dar? Diesen und anderen Fragen geht das von Arnold Picot und Tim Fischer herausgegebene Werk auf den Grund. In 15 BeitrÃ¤gen von Wissenschaftlern, Blog-Beratern und Unternehmenspraktikern aus den Bereichen Kommunikationswissenschaften, Betriebswirtschaft und IT wird das Thema Weblogs und “BlogosphÃ¤re” ergrÃ¼ndet. Die Autoren geben einen fundierten Ãœberblick Ã¼ber die aktuelle Diskussion in Deutschland und zeigen die professionellen EinsatzmÃ¶glichkeiten von Weblogs auf. Das Werk beschÃ¤ftigt sich zunÃ¤chst mit grundlegenden Aspekten von Weblogs. Der zweite Teil des Buches behandelt verschiedene Anwendungen im Bereich Unternehmenskommunikation, im dritten Abschnitt geht es um Journalismus und die BlogosphÃ¤re. Im abschlieÃŸenden Teil schlieÃŸlich werden verschiedene Unternehmen dargestellt, die mit Weblog-Technologie arbeiten, und es werden mehrere Fallstudien dazu prÃ¤sentiert. Das Buch richtet sich primÃ¤r an Leser, die Weblogs im unternehmerischen Umfeld einsetzen wollen oder im journalistischen Bereich arbeiten.